I am currently at the SPIE meeting in San Diego where I learned that Canon is going to start offering some of their sensor technology to other camera manufacturers. They were showing a number of new CMOS chips with extended NIR capability out to 1100 mm. In my view, most of those chips are uninteresting because they have 19 micron pixels. The one new chip that they had on display that was interesting was an APS-H (29.22 mm x 20.20 mm) with 2.2 micron square pixels. That is a whopping 13,280 x 9,148 pixel, 120 Mpx array! It has 28 output channels so that it can be read at 9.4 fps. Wow. The bin depth is 10,000 e- and dark current is 8.1 e-/sec at 60C. They couldn't give me a read noise or QE spec. The chip is available in a color (RGB) or a mono version. And now for the bad news. The price for chip alone is $10,000. I explained to them that for the amateur AP market, they'd have to get the price down by a factor of 2-4 before there would be much interest. To my surprise, they seemed interested to hear that news and expressed some interest in attending the AIC meeting to learn more about the AP market. Here's a photo of the chips that they had in the booth. Edited by jhayes_tucson, 08 August 2017 - 06:22 PM. Way to represent! That does sound like a chip that my super-fast wide field heart would love. Look on the good side of pricing. Way back when calculators first came out they cost $300-$400 which was a lot of money back then. Now you can get a much better calculator for $5 or so. I'll be getting one year older every year. I wonder how long it will take to get these sensors to a point that I could afford one! My FSQ106 wants that mono chip now. WOOOOOOO that sounds like a price to get observatories interested. I wish they would made a buttable version for future focal plane arrays. Looks interesting. I wonder how they do their gain? .5,1,2,4,8 times or e/adu and a 10 bit output... sacrificing DR for insane resolution? They mix and match data like 10,000 e- at .5x and then 8e-/s dark current at 8x. Needless to say I look forward to the release to hear more! 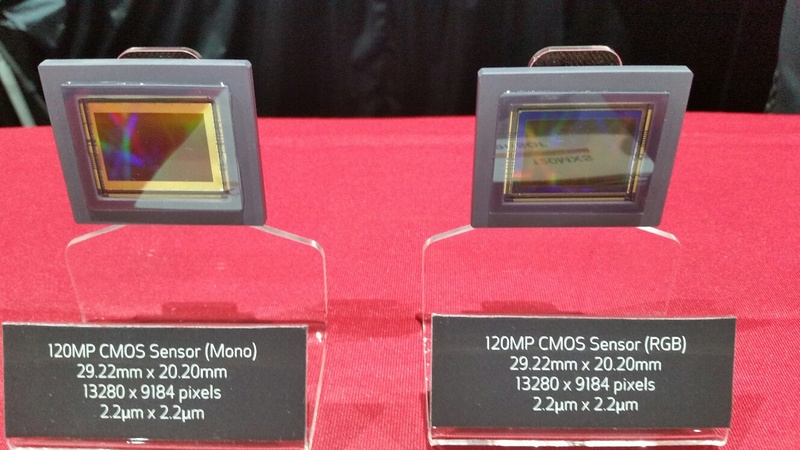 Yeah, I read about Canon offering their sensors on the open market on ImageSensorsWorld blog a little while back. I didn't expect them to offer that 120mp APS-H, though. That's pretty interesting!! So, if I am calculating correctly, if the dark current is 8.1e-/s @ 60C, by the time you cooled that sucker to -20C, the dark current would be ~0.03e-/s. That isn't too bad! Considering that Canon's smaller pixel sensors have fairly low read noise, those with 4.3 micron pixels have no more than ~8e- at the minimum gain, and newer ones have much less than that, we should be looking at only a few electrons of read noise. Lets say it's 4e-, that's ~68dB, or 11.33 stops. The ASI1600 at unity is 11.41 stops with 3.8 micron pixels, and has about half the FWC (so shorter exposures). If the pixels have read noise closer to other sensors with similarly small pixels, then it might only be about 2-2.5e-. That would give dynamic range of 12-12.33 stops. Edited by Jon Rista, 08 August 2017 - 11:17 PM. It would be an awesome HyperStar chip! i guess it's another group inside of canon, but almost every time there's canon people at AIC with DSLRs and lenses. so at least canon is not a stranger to AIC/ astrophotography. I think they regularly attend neaf also. And years ago they offered the 20da for amateur Astro. If these pixels kept getting smaller but the read noise stayed around 10e the smaller pixels would be bad for Astro. But if they keep read noise down and dark current manageable - the offerings may just get better and better as the prices go down. and the long delay until they make it to market? Are they just looking for a high-end gov't or corporate client to sell just a few to make a profit? The manufacturing setup of such a high-end sensor surely costs $$$$$$$? So maybe the big news in all of this is Canon will let other camera companies have a go at putting these guinness book novelties to actual use!!!!! Yes, I did explain to the folks at SPIE that Canon is at AIC (showing cameras and lenses) but this is a different group. Canon is big enough that not everyone is connected to what everyone else is doing. These guys really want to talk to other camera manufacturers--not so much to those of us who buy the cameras as end users. My guess is that the big problem with this kind of sensor is yield and that's what drives cost and availability. It wouldn't surprise me at all if they announced this sensor in 2010 after they got one barely working. It may have taken this long just to get the bugs worked out and to get the production process figured out. At 10k$ per sensor, they are looking for customers in the industrial markets first and that makes sense. To some degree, this is a solution in search of a problem. Prices will eventually come down but there is little doubt that this sensor was (and still is) ahead of it's time--depending a bit on how well it works. I agree that at this point, it falls into the "novelty" category. It would sure chew through disk space! It's a good thing that you can now buy a 4TB external drive at Costco for $110. I suspect that Canon makes an announcement when initial feasibility is shown, which is a long way from production.